Plan your stay in beautiful Whistler, BC. Please note: This calendar is updated monthly from www.whistler.com/events/calendar. Please refer to whistler.com for the most up to date information on local events. Canada’s ultimate touring hockey festival is coming to Whistler – Rogers Hometown Hockey. This free, family-friendly hockey celebration features two days of live entertainment, NHL alumni, local celebrities and hockey-themed activities for all ages. Running from Saturday through to Sunday evening, the festival culminates with an outdoor viewing party of the Toronto Maples Leafs v New York Rangers NHL game broadcast, hosted live by Ron MacLean and Tara Slone on Sportsnet. Where else but Whistler would performers entertain you with an electric mix of music, dance and spinning fire? Watch world-class athletes flipping and twisting through a burning ring of fire, then finish the night off with a first-class fireworks display. Following the show, head over to the Garibaldi Lift Co. (GLC) for the notorious Afterburn Party (adults only after 8 PM). Whistler knows how to après and now the whole family can celebrate a great day on the slopes with even more fun at Whistler Olympic Plaza. Parents can share stories about their day with a warm beverage while kids participate in a variety of outdoor winter activities and entertainment each week. 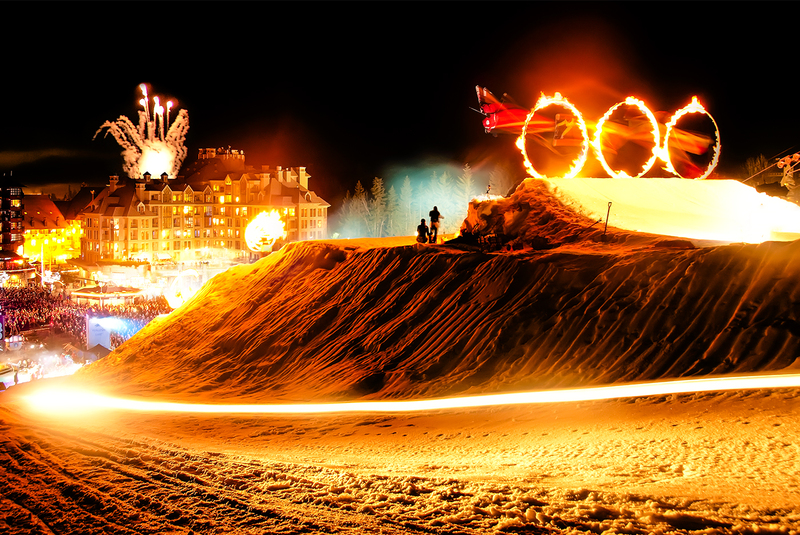 Where else but Whistler would performers entertain you with an electric mix of music, dance and spinning fire? Watch world-class athletes flip and twist through a burning ring of fire, then finish the night off with a first-class fireworks display. Following the show, head over to the Garibaldi Lift Co. (GLC) for the notorious Afterburn Party (adults only after 8 PM). Don’t miss this legendary spring festival celebrating Whistler’s mountain culture. Experience 5 days and nights of winter sports, music and the arts. This year’s festival will feature: The Saudan Couloir Ski Race Extreme, the world’s steepest ski and snowboard competition; The World Championships of the Monster Energy Boarderstyle Tour; Two ski and snowboard Big Air Competitions in Skiers Plaza; Enhanced music programming from internationally known DJs and musicians; The Freeride Après series with live music at various venues and popular multi-media showcases like the Olympus 72 hour Filmmaker Showdown. The Bici Gusti Gourmet Ride was created for the insatiable love for gourmet food and cycling. Take an early season spin with an intimate group of 70 riders through the Whistler and Callaghan Valleys. Along the 70 km route, you will be stirred by the beauty of the coastal mountains, peppered with moderate climbs and garnished with flowing descents. With Ned Bell preparing an exquisite post ride dinner created with ingredients gathered from within 70 km, this is the ride for you and your taste buds. GO Fest, Whistler’s Great Outdoors Festival celebrates Whistler’s great outdoors in springtime where winter and summer meet. From outdoor adventures from both seasons to arts and culture inspired by them, everyone is invited to get interactive with four days of active programming over the Victoria Day long weekend. A feast for your senses, the Whistler Farmers’ Market features local produce, tasty food, local artisans, live entertainment and family activities along the beautiful Upper Village Stroll between the Fairmont Chateau Whistler and the Blackcomb Daylodge. Markets happen every Sunday until Thanksgiving and every Wednesday throughout the summer with the addition of Saturday markets on June 29, August 3, 31 and October 12. ThinkBike Whistler is a multi-day expo, where the latest road and mountain bikes are available for test rides. The event opens for riding each morning with hundreds of high performance demo bikes (cross country, all mountain and downhill) supplied by some of the global leaders in bike design and production. This allows attendees looking to purchase a new bike ample opportunity and choice to make an informed decision prior to spending large sums of money on a high-end bike. Admission includes all bike demos, guided rides and access to the Whistler Mountain Bike Park. Tough Mudder 5K Whistler is not your typical fun run. The course at Whistler Olympic Park is located just 20 minutes outside of Whistler Village. There will be gorgeous views, mountain terrain, and picture perfect mud to test your strength, stamina, mental grit, and camaraderie. Test your strength, stamina, mental grit, and camaraderie at Whistler Olympic Park as Tough Mudder returns to the mountains. The course changes every year – you will have to prepare for anything and everything! Previous years have seen participants taking on ice water plunges, electrical shocks, crawling, climbing and more. Mark your calendars as the Whistler Children’s Festival returns for it’s 36th year. This action-packed weekend features two full days of live performances, interactive activities, and lots of hands-on creative workshops for kids and families to enjoy. Get ready for a race that is guaranteed to put your calves, quads and endurance to the ultimate test as the steepest 400m race in the world returns to Whistler Olympic Park. All ability levels and spectators welcome. Subaru IRONMAN 70.3 Canada will return to Whistler in conjunction with the Subaru IRONMAN Canada triathlon. Take up the challenge to swim, bike and run through the beautiful lakes, roads and trails of Whistler, British Columbia or cheer on the athletes at all stages and as they make their way to the finish line! One of the toughest triathlons in the world returns this summer when more than 2,000 athletes will take on Whistler’s beautiful lakes, mountain roads and Valley Trail network in a test of mental and physical strength. From the thrilling early morning start in Alta Lake to the triumphant finish adjacent to Whistler Olympic Plaza in the Village, this is an awe-inspiring day for spectators and participants alike. There’s plenty for athletes, family, friends and spectators to enjoy before and after the race, with special events and activities and an exciting atmosphere unique to the Subaru IRONMAN® Canada event. Whistler celebrates wellness when yoga and music come together in the mountains for the annual Wanderlust Festival in Canada. Yogis from around the globe will be down-dogging, dancing, dining on organic delicacies and sharing their wisdom in an amazing event across the entire community. Drawing the world’s leading yoga teachers, top musical acts and DJs, renowned speakers, top chefs and winemakers, Wanderlust Whistler is an event not to be missed. Crankworx is the defining celebration of mountain biking. A supercharged magnet for the world’s best riders and the definitive domestication of dirt in the service of epic endurance, supreme flow, monster air and gravity-fuelled mountain biking. Nowhere else will you find this caliber and collection of athletes, from across this many disciplines of mountain biking, together in one place. Over ten fearless days in August, the venues at the Whistler Mountain Bike Park will serve as a modern day Colosseum to the world’s best mountain bike athletes. Downhill, enduro, trials, pump track, whip-offs, music, art – this festival has it all. And don’t forget to sign up the little ones for Kidsworx.